After getting his 235th career hit on Friday, senior Byron McKoy became the Owls’ all-time leader in hits. Senior outfielder Byron McKoy just needed one more hit to become the baseball team’s career hit leader last Friday against New Orleans on a road trip in Louisiana. Batting leadoff for the Owls, he wasted no time breaking the record, connecting with the first pitch of the game. It was career hit No. 235 and his third triple of the season. PAUL KLEIN TTN Senior outfielder Byron McKoy plays left field for the baseball team. He broke Bob Filler’s all-time hitting record this past Friday. Filler played for the Owls from 1998 until 2001 and held the record with 234 hits. The record, previously held by Bob Filler (1998-2001), came as a surprise to McKoy. 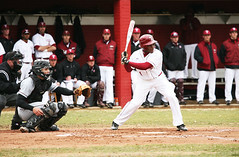 He said he didn’t realize he had a chance to break the record until he reached the 200th career-hit milestone in a game against Maryland Eastern Shore on March 9. During the past non-conference road trip, the Owls (21-16, 3-9 A-10) swept the Privateers over the four-game series by a combined score of 44-12. McKoy added eight hits and five RBIs in the series to extend his new all-time record to 242 career hits. As a freshman playing in his first collegiate start at Bethune-Cookman, McKoy went 4-for-5 with a three-run home run. The home run came in the eighth inning to aid an Owls comeback, which allowed the team to win after trailing by two runs. The Charlotte, N.C., native earned a starting role as a freshman, starting 44 games that season. McKoy, who was named to the Second Team All-A-10 and to the A-10 All-Rookie Team, led the team with a .352 batting average, while recording 64 hits and 31 RBIs. The Owls finished the 2008 season fourth in the Atlantic Ten Conference with a 16-11 record and earned an A-10 Tournament spot for the first time in six years. “His durability has allowed him to contribute to the lineup every day,” Valli added. McKoy has consistently been an everyday player for the Cherry and White, appearing in more than 180 games. This season has been no different for McKoy, as he has started all 36 games so far. “As far as staying healthy, I pretty much have to give credit to the strength coach, Marc Proto, who’s done a pretty big job of keeping the position players healthy with the kind of lifting we’ve been doing and keeping all of our muscles balanced,” McKoy said. Over the years, McKoy has developed into the team’s leadoff hitter in the lineup. He said he doesn’t feel the pressure as much as he enjoys the feeling of being able to get on base first. Valli said McKoy is an “excellent” leadoff hitter who has the ability to hit for extra bases. But that’s not where McKoy’s leadership ends. One of the highlights of McKoy’s senior season was playing the first three weekends in his home state of North Carolina where his entire family got to see him play. McKoy said his parents, cousins, nieces and nephews all made it out to the games. McKoy said he is focused on finishing his senior season and helping the Owls improve their 10th-place standings. The squad still has several conference opponents left to face including Rhode Island, St. Bonaventure, St. Joseph’s and George Washington. Currently, McKoy is breaking into the Top 10 of several other Temple baseball career all-time records, as he is third in at-bats (751), sixth in doubles (44), seventh in runs scored (153), tied for seventh in stolen bases (53), seventh in games started (177), tied for eighth in games played (186) and 10th in RBIs (125). Freshman jumper Aisha Brown recorded a personal-best mark in the high jump at the 49er Classic hosted by the University of North Carolina at Charlotte on Friday and Saturday.